Happy Thanksgiving! 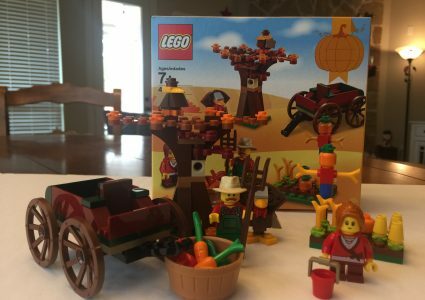 Today, in honor of Thanksgiving, I want to look at one of the season vignettes for 2017, the Thanksgiving Harvest! 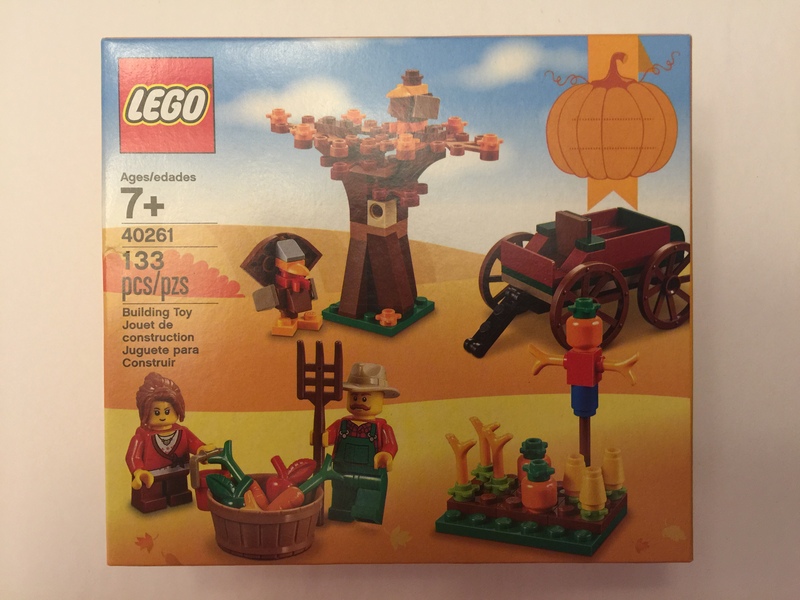 This is a fun little set that reminds me of small town America. Here we have a farmer and his daughter harvesting their fruits and vegetables from their fields. A bird watches carefully, waiting for them both to leave so he can swoop in and find himself a tasty bite to eat! A turkey lurks nearby, not knowing that soon he will be the featured guest at the dinner table. 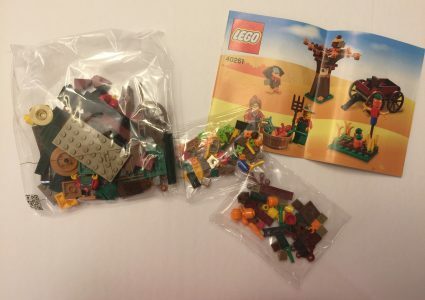 These sets usually include a few fun elements, and minifigures. 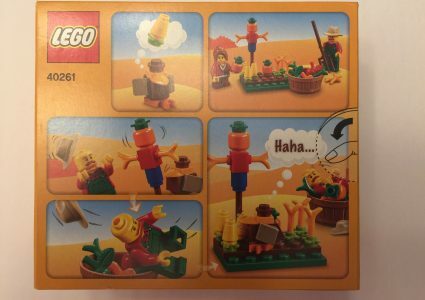 The farmer in this set is shown wearing overalls covering up his plaid shirt. The printing extends to the back of the torso, which is always a nice feature for LEGO® to include. The farmer has just regular green legs. He has a rather large and bushy mustache, and the hat he wears is perfect for those sunny days! Typical to a farmer, he has a pitchfork as an accessory. The little girl that comes with the set is wearing a sweater that is covering up her shirt covered in stars. She appears as if she is wearing a heart necklace, probably last years Christmas gift from her dad. Her torso is also printed on the front and back. In my opinion, she looks like she is ready to get into some mischief, with a sly grin on her face. Her hair piece has been seen before, nothing really special. And, of course, the legs are the short variety. Two of the other characters are the small bird and turkey. These are very well built using brick elements, and add to the fun of the set. The smaller bird can sit in the tree, while the turkey lurks on the ground, hoping to avoid becoming Thanksgiving dinner! The turkey is really detailed, the designer even captured the wattle on the turkey’s neck! The garden has a variety of vegetables to harvest, and includes scarecrow to keep the birds away. 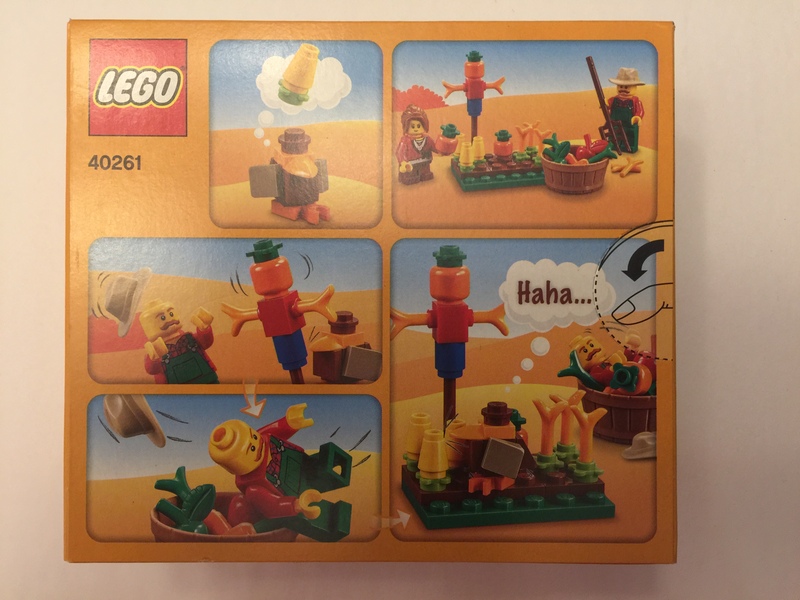 There is also a wagon that is a fun build. As a child I had a few of the Western sets, and Castle sets that used the same wheels. It was a fun throwback to my childhood as I snapped the familiar wheels onto the wagon. I’ll have to pull out one of my horses and attach him to the wagon! Perhaps one of my favorite builds in this little set is the tree. 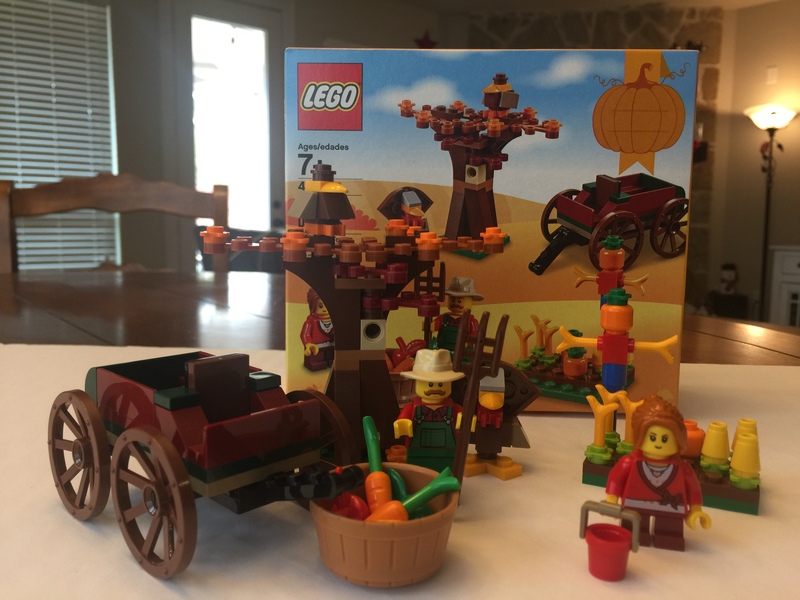 It’s a standard tree, but LEGO® captured the fall colors perfectly. The leaves have changed colors and started to fall. It really helps set the tone for the set, and I’m really happy it was included. It’s one of those things that I may leave out for display all throughout fall! Overall, for a $10 set, this is fun. It’s not too expensive, and if you’re clever enough, you can slip it in to the rest of the Thanksgiving decorations for family and friends to enjoy! I pray that all of you will have a very very Happy Thanksgiving!